Maggie was the first Jester x Bungee offspring to finish. Whelped 12/21/99, Maggie wasted no time in winning with Laura at the other end of the lead. 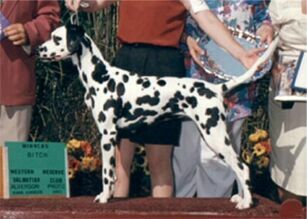 Finishing with back to back 5 point Specialty majors, she became Bungee’s eighth champion. Maggie enjoys the company of her sister ‘Faith’ and Mike and Laura Carpenter at Eclipse Kennels in Kentucky.